Fertility doctors say they have found a non-invasive way to screen IVF embryos for genetic abnormalities. The current method involves taking cells from the embryo itself, which experts fear may be harmful. 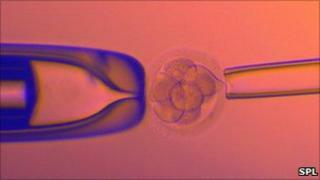 Now UK researchers say it is possible to run the same checks on cells surrounding the fertilised egg that are normally thrown away. The test could tell a woman if her baby was likely to have a condition like Down's syndrome. It would not only be less invasive, but cheaper too. Lead researcher Elpida Fragouli, from Oxford University, said: "In the ovary, the eggs are surrounded by a cloud of tiny cells, known as cumulus cells. "Cumulus cells are routinely stripped off eggs during IVF treatments and are usually discarded, so it should be straightforward to obtain them for analysis." Dr Fragouli's team examined cumulus cells from 26 women undergoing genetic screening prior to IVF treatment. They found abnormalities in the cumulus cells that appeared to tally with genetic errors in the eggs they had surrounded. Dr Fragouli added: "We are still in the process of establishing the usefulness of these genes as non-invasive markers of egg chromosome status and quality. "However, it is interesting that several of these genes are involved in vital cellular functions of the cumulus cells and egg they enclose, such as cell signalling and regulation, hormonal response and cell death, and so they may shed light on the genetic origins of chromosome abnormality." UK fertility expert Stuart Lavery said: "It would be much cheaper, much less invasive and something that may have a good clinical application. "Potentially what it may allow us to do is to have the ability of picking the best embryo from the best egg which means that we can hopefully move towards single embryo transfer." Putting only one fertilised egg into the womb avoids multiple births, which are known to increase the health risks of both mother and child. Should my hereditary disability stop me having a baby?